For many years Alienware has been the by-word for gaming cool thanks to an aggressive design policy and the choice of custom-ordering your own machine. The Aurora R3 continues these traditions, and then some. Just looking at it is enough to tell you it's the coolest thing in the room. And once the machine is powered up and ready to go, you've got some serious technology to play with. A word of caution though; if you want the best components you're going to have to pay for them. The Aurora looks something akin to the armoured train that tore through St Petersburg in the James Bond movie Goldeneye. The tower's angular armoured design is furnished with cooling vents along the top and Alienware's famed lighting around the sides. Measuring just shy of two feet lengthwise, you better have plenty of space next to your desk if you want to fit it in. 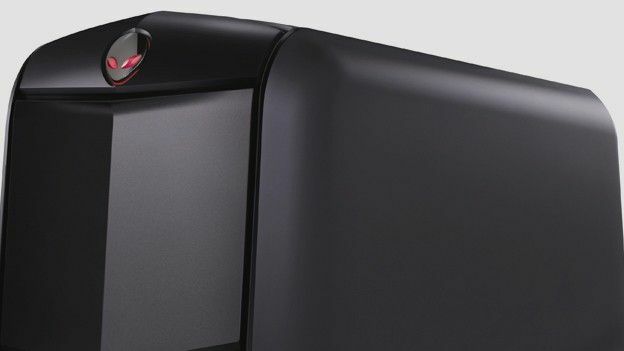 The luminescent Alienware logo is front and centre on the face of the tower and pressing it results in the front panel sliding downwards to reveal the DVD drive. A second panel on the top of the machine slides backwards to reveal four USB ports and 3.5mm sockets for headphones and a microphone. We won't lie; the design is easily the highlight here. Connectivity and storage isn't a problem here, no matter how many peripherals you have to expand the gaming experience. Along with the aforementioned front panel USB ports (one of which is the newer 3.0 format) there are eight more on the back, two of which are 3.0 compatible. You've also got 3 DVI connections, FireWire, eSata, Ethernet and six analogue ports for older peripherals. The 500GB of on-board storage is less than we'd expect for this price, but given the availability of cheap external storage, we're willing to forgive. The 8GB of 1333MHz DDR3 RAM also falls short in our opinion. It doesn't make much difference for gaming or general performance, but we'd consider this desktop an investment for a number of years and a little extra RAM goes a long way to future proofing a machine. The included 23-inch flat panel monitor is what gives the Aurora the edge over Alienware's popular MX gaming laptop range. The screen is mounted on an included stand that gives you plenty of freedom to adjust your viewing angles and the widescreen 1080p display is sharp and very clear. The Aurora comes fitted with an Intel Core i7-2600k quad core processor, which is suitably awesome for playing any and all games out there. Even Battlefield 3 if you can get hold of a copy. This is also down, in no small part to the graphics chip. Our review unit came with an nVidia GTX 590 card installed, although this is a customisable extra and will cost you more. The results are what we would expect from a high-end gaming PC. Even during heated sessions of Battlefield (lucky us) the Aurora kept up with the pace. Our biggest fear had been that during gameplay the tower would heat up enough to cook your breakfast on but, thankfully, things stayed cool in that department. Plus, it was also quieter than we expected. The Alienware's appeal lies in its looks and design. For a similar price you could probably get a better specced gaming PC, but it wouldn't have the same kind of swagger. If you don't mind sacrificing a few drops of performance (or paying for the difference) then this is undoubtedly the Grail of gaming. The Aurora is available now and can be custom ordered from www.dell.com/uk. Depending on what you want inside, the basic model starts at £899 but our review unit clocked in at £1,709 inc. VAT.